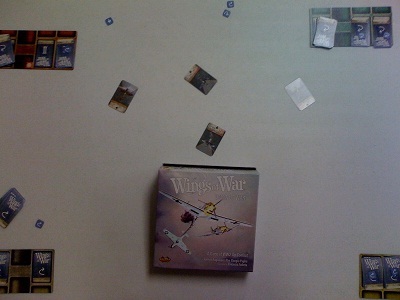 In Wings of War, each player controls several airplanes and attempts to maneuver them in order to be able to shoot down the other player's planes in a dogfight (or potentially trying to bomb things depending on the scenario). In order to move the planes, the players select both a maneuver card to execute and a speed at which to execute it; the interesting thing is that the players must decide on the next move that will be executed before the previous move actually occurs (essentially, you're always thinking two steps ahead). After this, the front movement card is played and the movements occur. From here, each player determines if his planes are in range and have a clear shot at any of the opposing planes - if so, the opposing planes take damage related to the distance between the two planes and the type of plane that is firing. Turns continue like this until one player has successfully shot down all of the opposing aircraft. The first pro of Wings of War is how the movement system works. Each of your movement cards has a line and one (or two) different colored arrows on it. When moving, you align the movement card with the front of your plane and then you lift your plane and align the arrow on the plane with the correct arrow on the movement card (based on how fast you were going). This is a really neat system and works pretty well in execution. The only down-side that I found to it was that, since the game was new and the cards were slick, the planes would slide and thus wouldn't be in the exact position that they were supposed to be. The next pro is the historical nature of the games. Each of the games in the series is based on actual fighters from World War I and World War II (depending on which game you have). I'm definitely not an expert in history, but I enjoyed getting to look at the different planes from these eras and I also enjoyed that, depending on which plane was used, the planes had different movement cards (in order to more historically depict the actual movement of those planes). To go along with the historical nature of the game, the last pro was the number of scenarios that were available. Between bombing runs and different kinds of dogfights, I think that the people who enjoy this game will be able to have a large amount of replayability because of the scenarios that are included. However, there was one serious con to me about Wings of War. This con was that we wound up circling each others' planes much more than actually shooting at each other. There are several reasons for this; obviously one reason is that we weren't good at the game - I'm sure if we played it more we would get better at maneuvering our aircraft. The next problem is related to the historical realism in the game; airplanes (unfortunately) can't make turn at a right angle. This means that you have two options to turn around: play a sharp turn for about 5 turns in a row, or play an Immelmann turn (where you flip your plane around 180 degrees). Either way, if you miss your shot at your opponent, you will probably spend the next several turns getting yourself back into position. Whereas some people may find this enjoyable, I was not one of them. Overall, I give Wings of War a 6.5/10. I feel somewhat bad about giving it such a low score when I can really only name one con, but the con was essentially the crux of the game. As a final note, I would like to re-point out that this is what I thought of the game; with the giant bias that the primary concept of the game (positioning your plane to get a good shot off) didn't hold my interest.